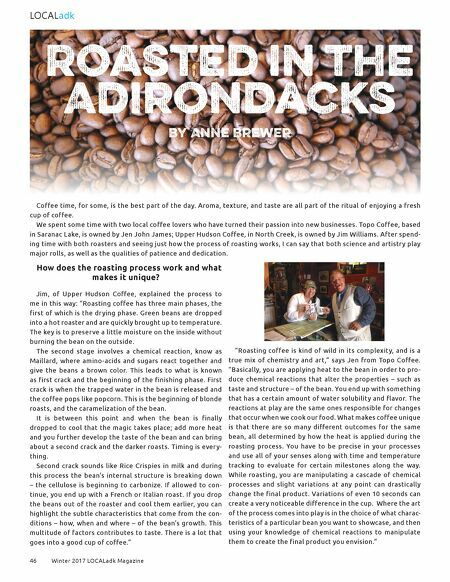 Winter 2017 LOCALadk Magazine 47 LOCALadk Upper Hudson Coffee " We source our beans from a cooperative in Costa Rica made up of 300 small, family-owned farms, with environmental stew- ardship a priority. The beans are designated SHB, which stands for Special Hard Bean. This means the beans are dense because they have been grown at elevation and in volcanic soil. It really all starts with high quality beans." 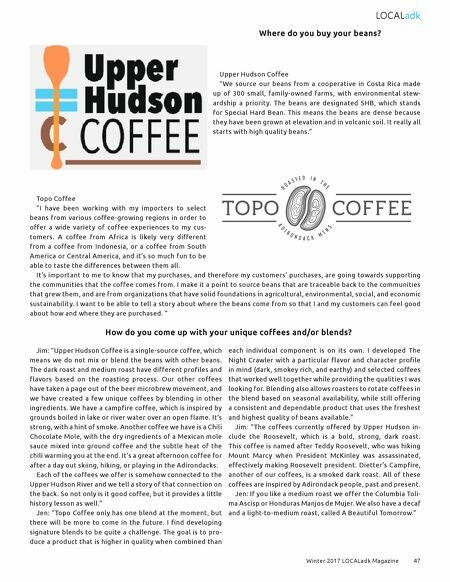 Topo Coffee "I have been working with my importers to select beans from various coffee-growing regions in order to offer a wide variety of coffee experiences to my cus- tomers. A coffee from Africa is likely ver y different from a coffee from Indonesia, or a coffee from South America or Central America, and it's so much fun to be able to taste the differences between them all. It's important to me to know that my purchases, and therefore my customers' purchases, are going towards supporting the communities that the coffee comes from. I make it a point to source beans that are traceable back to the communities that grew them, and are from organizations that have solid foundations in agricultural, environmental, social, and economic sustainability. I want to be able to tell a stor y about where the beans come from so that I and my customers can feel good about how and where they are purchased. " Jim: "Upper Hudson Coffee is a single-source coffee, which means we do not mix or blend the beans with other beans. The dark roast and medium roast have different profiles and flavors based on the roasting process. Our other coffees have taken a page out of the beer microbrew movement, and we have created a few unique coffees by blending in other ingredients. We have a campfire coffee, which is inspired by grounds boiled in lake or river water over an open flame. It's strong, with a hint of smoke. Another coffee we have is a Chili Chocolate Mole, with the dr y ingredients of a Mexican mole sauce mixed into ground coffee and the subtle heat of the chili warming you at the end. It's a great afternoon coffee for after a day out skiing, hiking, or playing in the Adirondacks. Each of the coffees we offer is somehow connected to the Upper Hudson River and we tell a stor y of that connection on the back. So not only is it good coffee, but it provides a little histor y lesson as well." Jen: "Topo Coffee only has one blend at the moment, but there will be more to come in the future. I find developing signature blends to be quite a challenge. The goal is to pro- duce a product that is higher in quality when combined than each individual component is on its own. I developed The Night Crawler with a particular flavor and character profile in mind (dark, smokey rich, and earthy) and selected coffees that worked well together while providing the qualities I was looking for. Blending also allows roasters to rotate coffees in the blend based on seasonal availability, while still offering a consistent and dependable product that uses the freshest and highest quality of beans available." Jim: "The coffees currently offered by Upper Hudson in- clude the Roosevelt, which is a bold, strong, dark roast. This coffee is named after Teddy Roosevelt, who was hiking Mount Marcy when President McKinley was assassinated, effectively making Roosevelt president. Dietter's Campfire, another of our coffees, is a smoked dark roast. All of these coffees are inspired by Adirondack people, past and present. Jen: If you like a medium roast we offer the Columbia Toli- ma Ascisp or Honduras Manjos de Mujer. We also have a decaf and a light-to-medium roast, called A Beautiful Tomorrow." Where do you buy your beans? How do you come up with your unique coffees and/or blends?